It seems that Mother Nature does not intend the 2015 RC44 Championship Tour to get off to a gentle start. Today near gale force southeasterlies were battering the coast of Malta, venue for the opening regatta of 2015, the RC44 Valletta Cup. With the wind forecast to build to a full gale later, most teams chose to get their practice in this morning before returning to their berths at the Royal Malta Yacht Club, within Valletta Harbour, and battening down hatches. 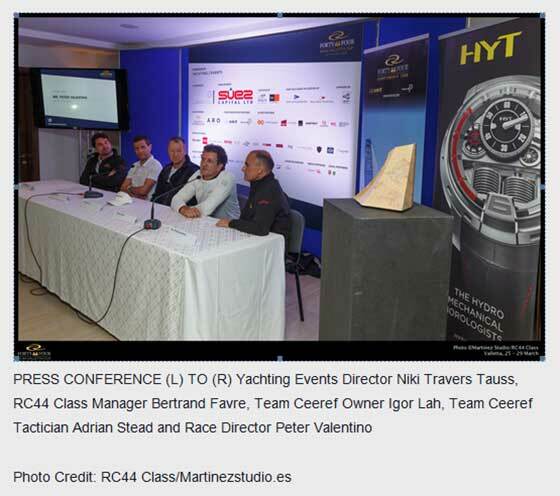 The RC44s' first ever visit to Malta has come about through the initiative of local organisers Yachting Events. The RC44 Valletta Cup is co hosted by the Ministry for Economy, Industry and Small Business, supported by Malta Tourism Authority and Transport Malta with backing from Suez Capital. While the names of the 11 teams competing in this year's RC44 Championship are similar to previous years, there have been a significant number of crew changes. A difference that many expect will affect this year's podium is the return of Slovenian skipper Igor Lah and his Team CEEREF. Lah stood down from the Class last year although he returned for the RC44 Sotogrande Cup, as guest helmsman on the Russian entry Bronenosec Sailing Team, which he steered to victory. Lah's Team CEEREF won the RC44 World Championship in Lanzarote in 2013 and, alongside Torbjorn Tornqvist and Chris Bake, Lah is one of just three owners who have been involved with the RC44 since its inception in 2008. Lah has only managed to hang on to two of his original 2013 team but has picked up several new crew, including Adrian Stead, Matteo Auguardo, Jon Gundersen and for this regatta Tim Powell, who have all previously sailed with the Mini Maxi World Championship winning Rán team. "My new crew is very good, very experienced," says Lah. "The competition will be tough, like it has been for a few years. It will be hard to get back, but I believe we will do a good job." The benchmark in the fleet remains Team Aqua who, under Chris Bake, last year claimed its fourth consecutive RC44 Championship win and as overall Tour leader is the holder of the ‘golden wheels'. However Bake is unable to compete in the first three regattas this season and has passed the helm over to Swede Richard Goransson, who comes from the Melges 32 and 20 classes where he campaigns Inga from Sweden. "Sailing the 32 and this - it is the hardest thing that I've ever done in my life," admits Goransson. "But I enjoy it immensely. I like the one design concept, especially at this level. It is so cool to be able to do this with all these incredible sailors." Coming from smaller boats, he adds that it is taking a while to get used to wheel steering again and tomorrow will be his first ever match race. John Bassadone's Peninsula Petroleum starts this season as favourite, having briefly displaced Team Aqua from the top of the leaderboard during 2014 and being the only one of the frontrunners to have retained their same crew, including Italian tactician Vasco Vascotto. An all-star cast is to be found on Artemis Racing Youth. This includes Beijing 2008 Laser gold medallist Paul Goodison and Sweden's three time Olympic medallist Freddy Loof and Australian long term Olympic campaigner, Anthony Nossiter. Among their tasks is training up young up and coming Swedish sailors Andreas Axelsson, Nils Akervall, Marcus Anjemark and Gustav Petterson. The format for racing this season remains the same as last with regattas kicking off with a day of match racing (the scoring for this rolls from regatta to regatta). Tomorrow the RC44 Valletta Cup will hold its match racing on the Maltese capital's Grand Harbour, surrounded by its giant bastions. The remainder of the event comprises fleet racing on windward-leeward courses, but the weather may prove to be significant. According to RC44 Class Manager Bertrand Favre, a front is passing through on Friday while Saturday may prove to be ‘go karting day'. At a press conference earlier today Favre expanded on why the RC44s are visiting Malta and how the island fits into the class ethos: "We go to some beautiful venues, some iconic venues and windy venues as part of the concept of the Class. But more important is that we are looking for support from the community who we want to get involved. Here we have the support from the community and that is important to us." The RC44 Class Association has partnered with Virtual Regatta to enable fans from all over the world to take on top international sailing teams and experience the thrills of the RC44 Championship Tour. Virtual Regatta Inshore will allow players to follow real-time racing in a dynamic and engaging way while lining up against some of the best sailors in the sport. In addition to competing in the five events of the RC44 Tour, teams will skipper their own virtual boat. Virtual Regatta Founder, Philippe Guigné said: "It is with great pleasure that we welcome one of the most popular events and most revered international regattas in the world to our game, Virtual Regatta Inshore." Play the RC44 Championship Tour Virtual Regatta Inshore game here: http://www.virtualregatta.com/index_vrinshore.php . Yachting Events' mission is to organise sailing and yachting events in the cleanest waters and in the wind factory of the Mediterranean. The sea is our play ground - our field of play. Our intention is to attract events and races to Malta, different to the ones already known to us and to introduce Malta to sailors that we usually only see on magazines or posters. The RC44 Valletta Cup is being organised by Yachting Events and co-hosted by the Ministry of Economy, Investment and Small Business, supported by the Malta Tourism Authority and Transport Malta and under the auspices of the Malta Sailing Federation and the Royal Malta Yacht Club.